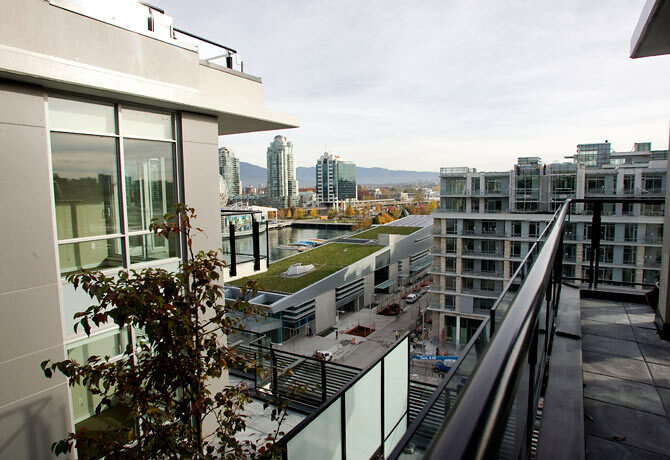 On the eve of the Winter Olympics' opening ceremonies, the waterfront condo complex in Vancouver that is housing more than 2,700 Olympic athletes and team officials is winning almost universal praise from its guests. The suites are, to borrow a favorite snowboarding phrase, sweet, with marble-top counters in the shiny new kitchens. Each unit has a living-room area  a far cry from the dormlike conditions of Villages past. And the views are nothing short of breathtaking. Many apartments look out onto an inlet and the silver downtown skyline, with snowcapped mountains as a backdrop. "It's blown us away, to be honest," says U.S. speedskater Chad Hedrick, who won gold, silver and bronze medals at the 2006 Winter Olympics in Turin, Italy, and is a medal contender this year. "They really went big on this. It's a million-dollar view, for sure." Paid for, thank you very much, by the taxpayers of Vancouver. More than any other project in recent Olympic history, the $1 billion residential complex represents the risks that urban governments face when trying to host one of the world's biggest parties. The city planned to invest about $47 million in the project back in 2006. However, cost overruns and the recession forced Vancouver to step in and bail out the private developers who were charged with financing the project. The city avoided the humiliation of welcoming the world with a half-built Olympic Village, but at a great price: in early 2009, new Vancouver mayor Gregor Robertson declared that taxpayers were "on the hook" for the $1 billion project. "What ended up happening was that the city became a bank for private-sector development," says Mark Cutler, director of Olympic Village Development for the Vancouver Organizing Committee, the body that is operating the complex during the Games. The city could recoup its investment if the developer sells enough million-dollar condos to Vancouver residents after the Olympics are over. That may have been a reasonable expectation in the real estate go-go days. Yes, the digs are nice, and the development has won kudos from environmentalists for the energy-efficient design of the complex, which has green roofs and will reuse rainwater, and for its easy access to public transportation. Metro Vancouver housing prices have rebounded from the worst recession lulls  year-over-year condo prices were up 15% in January  but it's still not the best time to be betting on real estate. "Things could still be peachy and wonderful," says Chris Shaw, an ophthalmology professor at the University of British Columbia and a vocal Olympic critic. "But they might not be. The whole Village fiasco leaves the city with fairly dangerous exposure." So even on the eve of the opening ceremonies, a moment when most host cities are glowing with pride, many residents are rankled. "People are ferociously upset about the Village," says Shaw. The spectacle has created a cruel irony: as the Olympic athletes enjoy the good life  free food, spacious rooms  in a taxpayer-financed housing complex, just a few blocks away sits Vancouver's Downtown Eastside neighborhood, site of some of the most acute poverty in North America. Homeless people and drug addicts hole up in back alleys; one church alone shelters 300 people on any given night. The neighborhood also hosts the first supervised heroin-injection location in North America. "For the city to let that occur while building the Village  that's the height of irresponsibility," says Shaw. Vancouver has set aside 250 of the 1,100 Village units for low-income residents, though some people fear that the city will be forced to put even those on the market to refill its coffers. Within the Village walls, the athletes remain blissfully unaware of the social cost that is enabling their Olympic experience, and potential success. They gather in a lounge called the Living Room, a roomy, restored-wood building with a warm, ski-resort feel. Three figure skaters from Great Britain are playing video games in the corner, and when they're asked about life in the Village, they sparkle like they've just landed a triple lutz. "It's amazing," says David King, a pairs skater. "We have the best view ever. The big bay windows are massive." Jenna McCorkell, another skater, chimes in, "It's strange, coming into the Olympics, you don't know what to expect. The rooms are everything and better." Rave reviews from the Olympians, for sure. But the taxpayers of Vancouver may sharply disagree.